Chess & Community Conference on April 1st! There is a positive initiative taking place in a city famous for its “Bulldogs” than anything else. However, University of Georgia (UGA) graduate Lemuel LeRoche has begun a new trend in Athens, Georgia with a youth empowerment program centered around chess. Laroche had the revelation after playing a game with an elderly Russian Jew in Dimona, Israel. He felt that would be the avenue that chess could break down walls of mental degradation and serve as a way to encourage youth to strive in a world where intellectual fortitude is becoming a necessity. There are a number of chess programs that have executed similar missions for youth such as Kevin Fite’s Detroit City Chess Club, Adisa Banjoko’s Hip Hop Chess Federation, Orrin Hudson’s Besomeone, Mazi Mutafa’s Words, Beats & Life and Frank Johnson’s chess-coach.net. Others such as Salome Thomas-El have written about these lessons in his book I Choose to Stay. Maurice Ashley’s work is also well-known. There is such a need for social engagement, and each of these mentors has found a unique way to express these lessons. For LeRoche, what started as one hour a month in 2002 has grown into a weekly program with 30-60 youth with themes such as “chess and pizza,” “chess and ice cream,” “chess and kayaking,” and even “chess and climbing.” There is also an emphasis on reading and scholarship. After officially starting Chess and Community in 2012, LeRoche also launched a conference designed to discuss elements of community-building and professional development. He originally planned his conference in January, but due to a snowstorm, it was canceled. With a bit of determination and serendipity, he rescheduled the event. 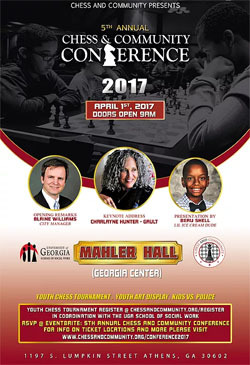 On April 1st, Chess and Community will hold its 5th Conference with acclaimed journalist and UGA alumnae Charlyne Hunter-Gault as its keynote speaker. Chess and Community (CC) is a youth development organization that impacts and equips youth with real world hands-on experiences through mentoring, traveling and community service. CC expands students’ perspectives on life and develops them to become leaders in their communities. CC offers an array of programs to assist youth in their expansion, while working diligently to foster positive communication and interaction within the Athens community.